Make this scrumptious Fruit Trifle for a sweet, creamy dessert! 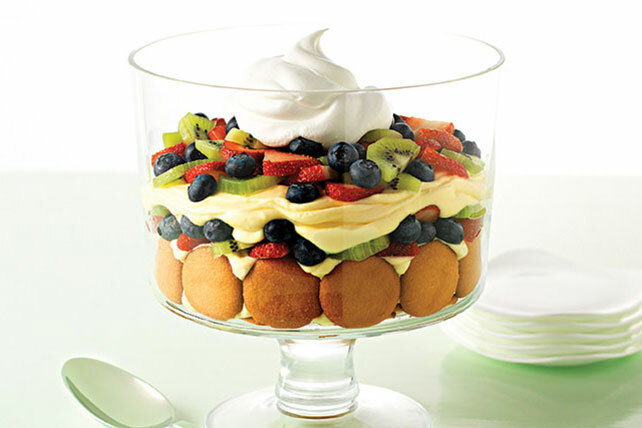 Layer vanilla wafers, fresh fruit and pudding in this simple yet delicious Fruit Trifle. Substitute orange juice or caramel ice cream topping for the orange-flavored liqueur. For individual desserts, layer ingredients in 15 wineglasses, parfait glasses or ice cream dishes instead of the serving bowl. Dessert can be refrigerated up to 24 hours before serving. 15 servings, 2/3 cup each.